Chances are, you’ve already heard that Google has announced a new algorithm update that will include “mobile friendliness” as a ranking factor. The expected “date” for this algorithm will be April 21, 2015. So what does that mean to you and me? Is the solution to use a responsive WordPress theme? Will a WordPress plugin meet your needs? If you don’t make your site friendly for mobile devices, will this Google algorithm update affect how your site ranks in the SERPs (Search Engine Result pages) for desktop computers as well? In the article, Unprecedented Google Announcement of a Mobile-Friendly Algorithm Change, (on BruceClay.com), Robert Ramirez briefly outlines what is expected to happen and the potential impact on us. In the past, mobile rankings have been tied to the ranking strength of your desktop site. If you had been ranking well on the desktop SERP (search engine result page), you would rank well on the mobile SERP also. Although the announcement addresses mobile search results there are rumors that (in the future) this algorithm could affect desktop rankings as well. It is unknown if this algorithm is being applied to a whole site or on a page-by-page basis. The assumption is that websites using responsive themes will be favored in the search results. For example, I manage several client sites (as well as my own) in GWT (Google Webmaster Tools). While Google has emailed me warnings for two of the sites I manage, I have not received a warning for my site (KeepUpWithTheWeb.com.). However, when I ran my site through Google’s mobile-friendly test, my site fails. So, what’s your plan? My first priority is to rectify the issues for my clients’ sites. One of my clients is approaching this as a re-branding opportunity. Together, we’re looking at all of her sites strategically. (Two of her sites are already on responsive WordPress themes). We are searching for a responsive theme and redesigning her main site. In the case of my other client, she has declined to take any action. Having invested in a professional site design (which she is very happy with), this client is not concerned that her site isn’t mobile-friendly. She deals mainly with corporate clients and she’s not willing to compromise her design. Should We Rush to Make our Sites Mobile-Friendly? At the 2014 SMX (Search Marketing Expo), Matt Cutts predicted: “Mobile is important, and coming faster than most people in this room realize”. The growth in organic search traffic blurs industry lines. While mobile devices are popular during late night and mornings, PCs dominate the 10AM-5PM slot and tablets are the most popular device during early evenings and prime time (8PM -12AM). What Does Your Mobile Traffic Look Like? If you want to participate in (or simply read) the comments in that discussion, check it out on Google+. One of my observations is that we’ll be seeing a lot of case studies over the next few months as people make their sites mobile responsive. In addition to the screen shots, Aleyda goes into details on how to use these tools and what questions we should be asking. She ends her article with tips for those of you who have a mobile app. What are your thoughts? Did you find the article by Aleyda Solis helpful? Did you receive a Google Webmaster Tools alert regarding your website? Does your website pass their mobile-friendly test? Are you adopting a wait-and-see position to see how this pans out. Hopefully, most of you are already using a responsive WordPress theme and are prepared. As always, please share your thoughts, ideas, concerns and recommendations in the comments below. Thanks for summing up the important parts, Sherryl. You’re welcome Tracy. Thanks for dropping by and sharing the link with us. It does look like it will be page-by-page. This is a really insightful and helpful post! When I designed my site, I tested it on both a Samsung Android and an iPhone. It looks great. But when I run the Google test link above it fails. Links too close together, images off screen (which it doesn’t do on my phone) and robots.txt blocked. I didn’t even know that last one existed? So much for thinking I’m perfect, lol…. Have a great week and thank you for being a powerful resource. I look forward to your re-design and seeing what it’s going to look like. Catarina let me know yesterday that she was getting strange results using Google’s mobile-friendly test. That prompted me to do some more research and I learned that there are issues with it. For more information, you can read “Flawed Google Mobile Usability Test Results” by Alan Bleiweiss on SearchEngineJournal.com. You can find it here: http://www.searchenginejournal.com/flawed-google-mobile-usability-test-results/127623/. This has all the signs of being a potential nightmare for some of us. We’ll see. Alan closes his post with “Hopefully, we’ll get more information at some point and with any luck, April 21st may NOT be the day they bang the “unfriendly sites” up against the wall.” Meanwhile, I’ll keep an eye out for more posts on this topic and try to keep everyone updated. As always, thanks for dropping by and joining the conversation. I wish all of us luck with this new update and hope you have a great week as well. Sherry it is definitely a good step by Google. Most of the students, people doing job and many other people nowadays browse websites and blogs on smartphones only. This step will make most bloggers have a mobile friendly version of their blog. Bloggers who won’t give importance on having a proper mobile version may not only lose the visitors, but they will also lose the search engine rankings. Sherry this was really a good write-up and that too on a topic which many bloggers are talking about. I may soon try to review some plugins which help in having a mobile friendly version of the blog. This definitely is a hot topic right now. It’s unusual for Google to announce that an algorithm update will have a “significant impact” on their search results. I just recently was made aware that there are issues with Google’s mobile-friendly tests results. (Thanks to Catarina.) It seems that it’s returning “Your site is awesome!” results for sites that aren’t mobile friendly at all. Hopefully, you’ll have luck using a plugin. Both my site and Adrienne’s sites are failing the Google test (even though our sites appear to be displaying correctly on our smart phones). We’re both using the same theme (Thesis 1.8.6). The issue could be with the complexity of that theme. Thanks for adding your insight to the conversation. I’ll be by your site soon to read your review of Long Tail Pro. I’ve been seeing that discussed a lot lately. So, I’m interested in what you have to say about it. My Swedish site is fine and has always been. Use the same theme and WPTouch. But when it comes to my blog sometimes Google consider it mobile friendly sometimes not. Honestly am beginning to question how accurate what Google sees is. In January this year apparently 118 pages had errors that affected mobile friendliness. Then for some reason unknown to me a month later it was down to 4. In the beginning of March you and I arranged so that I could re-install WPTouch and suddenly 8-10 pages had errors that affected mobile friendliness. Now it seems to be 8. TODAY it has most of the time been NOT mobile friendly but NOW IT*S MOBILE FRIENDLY AGAIN in the space of less than an hour. Something’s not quite right with what Google’s doing. Considering that how they will rate us on how mobile friendly our sites are it’s alarming that they come up with different answers to that questions within an hour. Catarina recently posted..Are you innovating on a continuous basis? To be honest, I haven’t read the entire article yet. (I’ve bookmarked it for later.) A quick scan didn’t unearth any solutions though. What it does is confirm what you’re saying. Additionally, the author – Alan Bleiweiss, warns that you may get a ““Your site is awesome!” result for a site that’s not mobile friendly at all. I’m so glad you let us know about this! Thanks so much. I hope you had a great weekend. Thanks, Sherryl. Read it and not even Google knows what’s right or wrong. Got not mobile friendly, deleted some photos. checked again and now it has been considered mobile friendly three times in a row. The author, Alan, contacted Google and they claim the “Mobile-Friendly Test” is the most accurate. But what they will do and how and when is still a question mark. Which plug-in for compressing images, do you recommend? Seems that’s an area that’s causing problems. I’ve followed Alan Bleiweiss on Twitter and added him to my “SEO Authorities List”. I’m keeping an eye on this topic and as I learn more, I’ll share it. Do you resize your images before you compress them? I never use an image larger than 600px wide. So, I resize them first. Hi Sheryl, I was confident my newly redesigned website would pass the mobile friendliness test, but I had to run it any way just out of curiosity. 🙂 luckily I got an Awesome! My site is mobile friendly response. With so many people logging on today via mobile devices I think it is critical that our sites are set up to be viewed correctly on these devices. Now that the Google algorithms are going to use that in their ranking too is just one more reason to make sure you are on board. Awesome Susan! 🙂 Your blog posts are easy reads and full of colorful illustrations. So, I would think that your site would attract a lot of mobile users. Your blog is one that I like to visit when I’m relaxing – (rather than researching). It’s great you have your redesign behind you. Thanks for the visit. I hope you’re having a wonderful weekend. We’re in the midst of an “Arctic” blast right now. It’s 33 degrees and the temperature is dropping. It’s a good day to stay inside and catch up on commenting. Although, I’m tempted to go out in the kitchen and cook a hearty seafood chowder. The howling winds are making me feel chilly. Since all the buzz started about mobile friendly blog design, I have fell relaxed and never worried for a secon. Though, while some people will argue that not all studio press theme are completely responsive, but I think am just lucky to have settled with one that completely does – Prose. While reading this post and coming up to the screen shot of Rand’s discussion, I don’t understand why he(Rand) wants to take the option of waiting till after April 21 before doing the needful? Though I understand that these people like testing, research, case studies etc. But this is something you can completely avoid and move onto the next big thing. Well, who knows better than the “Wizard of MOZ”?, I guess no one. Do have a lovely weekend, Sherryl. Thanks for the recommendation of Prose. I took a quick look at it and it seems simple and clean. As for Rand Fishkin’s comment, I was surprised how low the percentages are for the number of users that access MOZ related sites via mobile. (I’m referencing Cyrus Shepard’s comment in the Google+ discussion). Still, a lot of people are disagreeing with Rand’s decision to wait. I’m looking forward to the case studies! What I really want to know is if not having our sites mobile-friendly will affect our rankings in the search results performed on desktops. Now, if it does, that will be a real motivator for anyone who is dragging their heels on this one. You have a lovely weekend too and thanks so much for contributing to our discussion! I agree with you Aansy. It does come down to the user experience. That’s true for desktop users as well but with mobile access growing so quickly, the focus seems to be on “UX” design now. Thanks for joining us here and adding your insight. Awesome post Sherryl with exciting details and resources. I have always known my theme to be mobile friendly but I still felt the need to test after reading this post. Congratulations on passing the mobile-friendly test. It seems that most readers (who are commenting here) are ready for this update. We had been warned. Still, I had settled for using a plugin to display my site on mobile devices. While it looks fine (to me) on my smartphone, Google apparently found issues with it. So, I am going to have to switch themes. It’s time for a fresh updated look. Thanks for dropping by and you have a wonderful weekend too. For the longest I refused to read any articles on my mobile phone, even when more and more themes became mobile friendly. Now I find it very convenient since I read a lot a blog posts now on my lunch breaks and the fact I have limited time. But I did feel this day coming. I did install a mobile friendly them I’m the previous year and it has worked out quite well for me. I haven’t had any problems yet. according to what Google plans to do my blog is safe from the penalty. This will be a great step forward in the blogosphere. I haven’t checked to see if Google sent me anything regarding this but will do this soon! Thanks for the heads up! have a great weekend! That’s great that you’re already using a responsive theme. I’ve put it off for way too long for sure. I resisted reading blogs on my phone for a long time. The thing is that I find it easier to do some things on my phone rather than on my desktop (like buffering tweets). So, I’m reading more blogs than I used to. I don’t comment from my phone though. Sometimes I mean to go back and comment but I don’t always do that. It makes me wonder if the increased use of mobile is affecting the number of comments that we get. I don’t know for sure but I think that the Google alerts on Webmaster tools are being sent to the websites with the most mobile usability issues. I haven’t received any alerts for my site, (even though it failed the test). You have a great weekend too and thanks for weighing in on this! As you know, I’ve had concerns about this upcoming change as well due to my theme not being responsive. I do use a plugin to make it mobile ready but most of the sites I’ve tested it on had me failing like you mentioned that your site did as well. The funny thing though is that I just tested by blog and a few posts through the link you provided above and I passed. I’m actually shocked because for some reason some of the sites were telling me it wasn’t mobile ready. If you access my blog through your mobile device though I most definitely is. I was freaking out actually not wanting to get hit yet again by Google but I don’t have a lot of mobile traffic accessing my site. In the eyes of Google though they’re looking for specific thing but at least I know I don’t have to rush getting a new theme either because I haven’t found one I like yet. I’m close though, I think. Thanks for sharing this information with us because this is important for us all to know. I might not like a lot of what Google does but I still don’t want to be on their bad side. I switched to a “mobile responsive” child them on the Genesis platform early on – only to learn that it isn’t totally mobile responsive. Even with a “mobile responsive” theme we most likely will continue to need a plugin to make videos mobile responsive. I had to manually add some code to the mobile responsive child them I chose to get the images to work, but what I really need to do is change themes again. Wouldn’t it be great if someone technical tested a bunch of popular theme choices and let us know how they rank for mobile and speed? I rather doubt that would happen – but I can wish! I’m considering moving to the Genesis framework and it wouldn’t have occurred to me that a Genesis child theme wouldn’t be totally mobile responsive. I haven’t investigated child themes yet but I’ll make sure to research it thoroughly first. Thatt would be great if someone tested a bunch of popular theme choices and ranked them! It’s great to see you here. Thanks for sharing your experience with Genesis. That’s weird because I use the same theme (and the same plugin) as you do and my site is failing on that link. One of the errors is that my menu items are too close. I think my blog looks fine on mobile too. The way the algorithm update reads, it looks like they’re talking about appearing in the search engines for searches from mobile devices. There’s speculation that Google could potentially favor sites that are mobile friendly for searches on desktops as well. From what I’ve read, that’s unclear though. The way I look at it is if someone like Rand Fishkin isn’t rushing to make MOZ mobile friendly, we should be okay making sure we don’t rush into anything It’s sure going to get interesting to see what happens. I am so with you that it’s important to know what Google is up to. Not knowing something could put us at risk. It’s best to try to keep up with them. This is called a post offering a prompt solution. After reading that much significance of a mobile friendly blog I first tested both my blogs once again to check how they are and much glad to know both meet the criteria. This is an age of flexible display. Now people see the contents as per their convenience and change the size with the options of iphone, ipad and pc. From monetizing point of view it is equally important to make our blog displayable in all sizes to enable readers click on our ads and products. Congratulations on both of your blogs passing the mobile friendliness tests and I’m glad that you found my post informative. I’m sure some people will check their site and if it passes, just move on to another topic. I appreciate that bloggers like you want to have a better understanding of what is behind the algorithm and what we can take away from this to make our sites even better. Your point about monetizing our sites to enable readers to click on ads and products is a great reminder. Thanks for bringing that up ! As always, it’s great to see you here and I appreciate your sharing your insight with us. Sherryl, yes, it’s not hard for a good developer to take your current look, write a few media-queries and get your site ready for mobile. For one client, I made her site look almost like an app on mobile. Basically, it hides something like a slideshow on mobile and only shows what you want it to show. I do like the idea of Genesis framework for you – you can then go with the Genesis updates as well. You can still get a custom look. Your site really does already have a classic look – header, menu, right sidebar. Easy to set up in a good framework. And the media-queries make sure it works in mobile (just be aware you will have to do some testing and tweaking). Leora Wenger recently posted..New Website: Coming Soon Page? I’ve read that there are a lot of plugins for Genesis too. I’ll definitely check into it. A friend of mine mentioned to me that all Genesis sites look similar to her but I need to look into it myself. Thanks! By the way, you (or rather a good web developer) can make the Genesis framework look like anything you want. It’s just the base. If you take a Genesis theme and never tweak it all, yeah, you will get the same. But that’s why I tell people that child themes exist. That way you can tweak the site and still get the benefit of updates. When I do a site with underscores, you get a great basis, but you can’t update it the same way you update Genesis. Thanks Leora. There’s a reason that Genesis is so popular and an endorsement from you is what I needed to hear. I’ll start looking at Genesis child themes and let you know when I’m ready to get started. Thanks for writing this and yes, I’m ready! I am a huge believer of good WordPress themes and using Genesis Framework and custom theme is plain powerful! It certainly makes mobile marketing and making it super friendly on search easier. Appreciate the heads up and shared on Triberr! *PS How are you by the way? So, you’re another happy user of Genesis Framework? I’ve started looking into new themes and I haven’t decided yet if that’s the route I want to go. I’m glad you enjoyed my post. There’s a lot being written about this algorithm update. I always think it’s helpful to pull highlights from a few resources to give readers an overview. 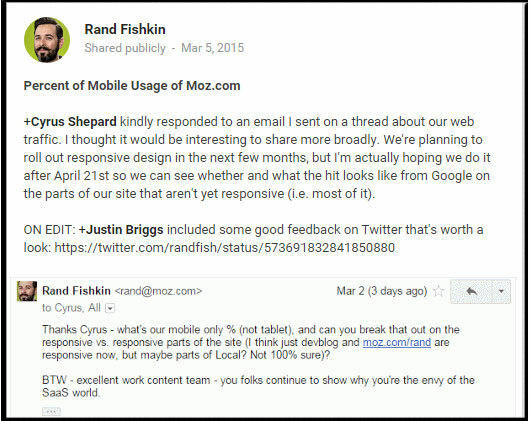 For me, reading Rand Fishkin say that MOZ is rolling out their responsive design over the next few months is helpful. It reinforces the idea that it’s more important to make any design changes thoughtfully and strategically rather than just jumping into it. As always, thanks for dropping by and sharing your thoughts with us. I have not been blogging as frequently as I should. (I hope to get back into it soon.) The same for making the rounds to my favorite blogs. I promise to be by soon! Sherryl — thanks for sharing what you’ve learned about Google’s mobile algorithm. You didn’t mention 3rd party vendors that will host your mobile site. I use DudaMobile and I’ve been happy with it, although I will double check after reading your post to see if everything is working properly. My website passed Google’s mobile friendly test — “Awesome!” it said. I am getting a lot more traffic from mobile. I receive a weekly traffic summary from DudaMobile and while it’s not actually awesome, it keeps growing. The service is quite inexpensive and I see they’ve got a sale going on (no doubt inspired by the competition of responsive designs). They will host free of charge if you will run ads. Prices range from $3.75 per month to $11.25 as functionality is added. I have the $7.12 monthly plan (no ads). A third-party host could be a quick solution as you and others develop sites with responsive design. You can set up your mobile view yourself on their site and tech support will walk you through the process if you have any questions. I’m not an affiliate, and I’m sure there are similar services you could explore. I would have to research the SEO implications of using a 3rd party site before I recommended it. I checked your site on my phone and it loaded quickly and represents your brand well but I’m on Dudamobile.com (not WriteSpeakSell.com). Does that have any impact on your site traffic? Thanks so much for kick-starting this and sharing your insight with us! There is no mention of either responsive design or use of a 3rd party vendor. I gather then that it’s the results the reader sees when on your site. Hope this is helpful. I’m sure it’s a safe solution. I just don’t like driving traffic to someone else’s website. Thanks for the additional information. If anyone here is interested in creating a mobile version of their site on DudaMobile, Jeannette generously shared a 50 % off discount coupon code with us. Just enter Spring2015. The sale ends March 23! That includes no ads, a custom domain, full analytics, web hosting, site backups and access to developer mode. BTW – neither Jeannette nor I are affiliates. Next post: Are You Confused about Google’s New Ranking Signal?